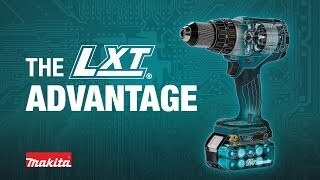 The Makita 18V LXT® Lithium-Ion Cordless 5-3/8” Metal Cutting Saw (model XSC01T) delivers cordless cutting power to the jobsite. The XSC01T has a Makita-built high torque motor and a compact design for a wide range of cutting applications in a variety of metal materials including Unistrut®, all thread, channel, corrugated, conduit, pipe, sheet metal, square tubing, steel and more. The 18V LXT® 5.0 Ah battery provides 65% more run time per charge than the BL1830 battery, yet it charges in only 45 minutes – the fastest charge-time in the category – for less downtime and increased productivity. The 18V 5.0Ah batteries included in the kit feature on-board L.E.D. charge-level indicators for added convenience. Max. Cutting Depth : 2"
Net Weight (with battery) : 5.7 lbs. Shipping Weight : 16 lbs.